All information is from the Virginia Department of Education. 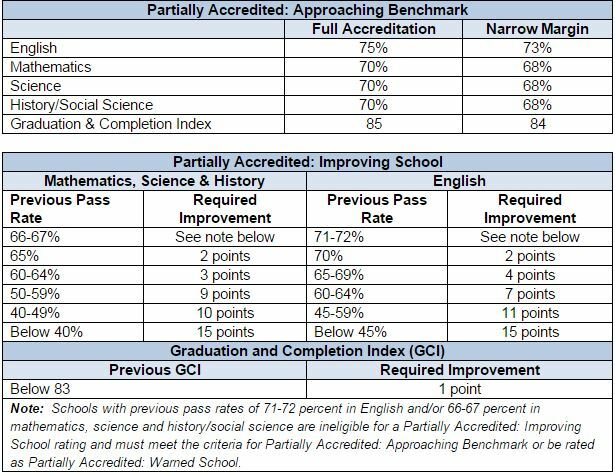 The Virginia Board of Education has revised its school accreditation standards to better inform the public about the progress of schools toward meeting the commonwealth’s high expectations for student learning and achievement. The revised Standards of Accreditation (SOA) — effective on October 8, 2015 — create new ratings to differentiate schools that are close to meeting the requirements for full accreditation, or that are making significant progress, from those that are not. The achievement levels on Standards of Learning (SOL) tests required for schools to earn a rating of “Fully Accredited” have not changed. Partially Accredited: Improving School-Graduation and Completion Index — High schools that have attained the adjusted pass rates required for full accreditation, and that have improved their GCI by at least one point from the previous year, but that are not within a narrow margin of the GCI required for full accreditation. Partially Accredited-Reconstituted School — Schools that fail to meet the requirements for full accreditation for four consecutive years and receive permission from the state Board of Education to reconstitute. A reconstituted school reverts to accreditation-denied status if it fails to meet full accreditation requirements within the agreed-upon term, or if it fails to have its annual application for Partially Accredited-Reconstituted School renewed. Under the revised SOA, schools rated as Partially Accredited: Approaching Benchmark-Pass Rate, Partially-Accredited: Approaching Benchmark-Graduation and Completion Index, Partially Accredited-Improving School-Pass Rate, Partially Accredited: Improving School-Graduation and Completion Index, or Partially Accredited-Warned School that do not earn full accreditation within three years are denied state accreditation, unless allowed to reconstitute by the state board. If a school ultimately is denied state accreditation, the local school board must submit a corrective action plan to the Board of Education and enter into a binding memorandum of understanding with the state board detailing steps to be taken to raise student achievement to state standards. Schools denied accreditation, however, do not lose state funding, nor are they subject to state takeover. The revisions align the Board of Education’s accreditation regulations with legislation approved by the 2015 General Assembly. House Bill 1873 and Senate Bill 1320 require the board to amend the Standards of Accreditation to establish additional accreditation ratings that recognize the progress of schools. School accreditation ratings for the 2015-2016 school year — based on the revised standards and criteria — are scheduled to be released on October 27, 2015.